Banana, oat, and chia seed muffins: could any baking recipe sound healthier from the get go? In spite of this, these muffins are neither dense nor tasteless nor any of the things you might associate with a super healthy muffin (or oat/bran muffins in general). They’re light, crumbly, and just the right amount of sweet. The muffins feature whole wheat flour and rolled oats, as well as freshly mashed banana and chia seeds, so they’ve got a reasonable amount of fiber and protein. Like most muffins, they’d be pretty light for breakfast, but not if you pair them with some fruit or spread them with almond butter, and certainly not if you have two. They’re also a perfect snack, which is how I tend to enjoy muffins most often these days: wrapped up, tucked away into my backpack, waiting to give me a happy surprise between afternoon classes. The muffins have just the right amount of cinnamon and ginger, so they’ll make your entire home smell like fall. And they’re easy to customize, too: feel free to swap all-purpose flour for the whole wheat (you can use gluten-free, all purpose, too), or to trade mashed banana for applesauce or pumpkin puree. It’ll be a different flavor, of course, but you’ll still have a delicious and wholesome treat on your hands! Preheat oven to 350 degrees and lightly oil a 12-muffin baking pan. Whisk the ground flax with 3 tablespoons warm water and set aside. In a medium sized bowl, whisk together the non-dairy milk and apple cider vinegar. In a large mixing bowl, combine together the flour, oats, baking powder, salt, cinnamon, ginger and chia seeds. Add the mashed banana, sugar, and oil to the milk & vinegar mixture. Stir in the flax mixture. Add these wet ingredients to the dry ingredients. Mix until the ingredients are just combined. Add ⅓ cup batter to each well in the muffin pan. Sprinkle the tops with extra rolled oats, and bake for about 22-25 minutes (or until muffins are browning and a toothpick comes out mostly clean). Enjoy with fresh fruit, or with a schmear of almond or peanut butter for a healthy snack! Muffins can be wrapped individually and stored in a cool, dry place for up to 4 days. Once wrapped, they can be frozen for up to 4 weeks. 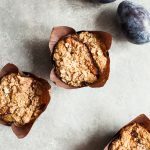 These, like my whole grain plum muffins and zucchini date muffins, are sure to become a staple baked good for me, and I hope they might become a regular treat for you, too. See you back here tomorrow! Looks great, both as a snack for school and as a fun baking break from the mountains of schoolwork piled up around me! Thanks for the inspiration to step away from my desk! I never ever comment on spelling and the like on other blogs because god knows I make some amusing typos, but I have to admit that the use of “male syrup” as a sweetener made me smile and giggle out loud. Sorry, I’m, like, 25 going on 12 sometimes . I fixed it but shouldn’t have. Best typo ever. Haha I totally wish I witnessed that typo! That’s a good one, Gena. I *love* dense, chewy, hearty, not-too-sweet muffins. They’re the best kind for splitting and topping with nut butters 😉 Procrastibaking has always been my modus operandi too; well done to you for giving yourself a deserved break! I really like the simple, wholesome ingredient list and imagine these taste even more delicious with a little earth balance or jam spread on top. This is one of those annoying instances where I have just about everything on that recipe list aside from an actual muffin tray. I’ve been meaning to make some sort of baked good to supplement my library lunches and this looks like just the thing – I adore banana and cinnamon! I love it when you have baking and/or dessert recipes. Thanks for sharing these, Gena! I bet your house smelled amazing while these were baking. And yes, bananas and cinnamon are heavenly tasting and smelling. Three cheers for denser, chewier, less airy muffins, too. I love anything that’s nice and dense and thick. Like a dense brownie would be 🙂 I think it’s the bananas that help with that. Sometimes when I make banana bread or muffins they get that density..and I love it. No more convincing needed here! This is on my list of school snacks to make, and I like my snacks dense as opposed to cake-like and reminiscent of dessert. I definitely haven’t been getting my chia in, so these are certainly called for! Banana and oat anything is a great combination, not least because I always have both on hand. SO ready to make these. Ah, I wish I’d seen that typo–sounds like the best one I’d have seen in a long while (“garish” for “garnish” (not on your blog) was pretty choice, too). I’ve been enjoying the combination of banana, chia and gf oats myself in the little bars I make (which sound somewhat like over-healthified versions of these, note to self!) I seem to have been having some difficulty with bananas lately, though (ironic, after those years I practically lived on them). My ND says they have a protein in them that’s hard for some people to digest–sounds surprising, but accords with my current experience. I’ve been having fun seeing what similar-textured foods can be used instead of bananas! i love banana oat combos, and chia seeds gives it the perfect kick! those muffins look so cute! they are the perfect snack size! These little muffins look so delicious! I totally agree with you – I also prefer a denser muffin. Hope organic chemistry is treating you well, Gena! I love a good breakfast muffin, and these sound awesome. Thanks for sharing the recipe. I’m really not the expert on GF baking. But I’m sure that buckwheat flour would work here. These look AMAZING. I will be running immediately into my kitchen after work today to make them. Quick question for you about agave – I’ve been seeing a lot of posts lately about how it’s all processed and bad for you, etc… but I really like to use it, so I was wondering if you might have a brand that you suggest? I don’t want to give up on the stuff just yet! I am definitely part of the health-minded folk! I love that word and may use it more often in describing some of my baked goodies, because when people bite into something that they expect to much cakier but is in fact heartier, they make me feel like a bad baker! These are amazing! I used GF flour bc I was cursed with celiacs and they still turned out great. you wrote that these can be made gluten-free. how do i do that? great looking recipe ! I would use a gluten free flour mix (your favorite home blend or a store bought one) instead of the WW flour, and substitute quinoa flakes for the oats. 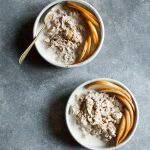 A note to Gena: even though oats are debatable as to whether they’re suitable for celiacs and other gluten sensitive folks, many of us can’t tolerate even the ones that are labeled gluten free! Quinoa flakes make an excellent substitute for them & are still healthy, which I love. And you can tie it all together by using quinoa flour in the muffin itself! I made these the other day and they are delicious! I’ve basically been living off of them. Just a quick question about the chia seeds – I know they’re considered a raw superfood, do they still retain some benefits when used in a baked good like this? I made this yesterday and it was absolutely great. I baked it in a loaf pan instead of muffin cups. A friend tried it and said it was the best banana bread he ever had. I agree. It tastes so delicious and feels so healthy to eat it. Just made them and they taste wonderful! Made a couple of changes to the recipe as I didn’t want to run out to get additional ingredients – used whole wheat pastry flour. Instead of 3 ripe bananas, I used 1 as that was all I had left. Substituted the remaining 2 bananas that were called for with 1/2 cup prunes and 1 kiwifruit. Talk about loads of fibre! Instead of almond milk I used chocolate almond milk as that was what i had in the fridge. I used 1 1/2 cups chocolate almond milk in all instead of the 1 1/4 cup required as I found the batter a tad too thick. Forgot to add the vanilla though. Ground golden flax seeds into flax meal and mixed it with 4 tablespoons hot water. The resulting batter was scooped into a 12 muffin tin (did not use 1/4 cup of batter per muffin – I filled each well completely). Baked them for 35 minutes total. End result – hearty muffins, not too sweet, and with a moist crumb! Thanks Gena! Wow, incredible blog structure! How long have you ever been blogging for? you made blogging glance easy. The whole glance of your site is excellent, as smartly as the content! Any idea how many grams of fiber these are? I’m trying to find ways to incorporate more fiber into my husband’s diet and it’s really difficult to find 38 grams per day because he’s such a picky guy. One of those….”Ew, that’s healthy so it must be icky” types. Jeanne, I’m so sorry, I don’t know. I bet you could use an online program to tally it up? Jeanne – ha! My husband is the same way – though he loves these kinds of muffins. I used an online calculator – and each of these muffins has 4 grams of fiber if you make 18 muffins (mine always make 18 rather than 12 – I fill them almost full). I used honey instead of syrup (running low on syrup) and with that substitution, they are 122 calories each. This is my third time making these and they are pretty amazing. I have made them as large, small, and mini-muffins and everytime they have been well received. I have replaced 1 banana with vanilla soy yogurt to good effect, but they don’t need this modification as they are moist and flavorful. So glad you like them, Bruce! Gena – I wanted to let you know how much I’ve been loving this recipe! I’ve made it in a loaf pan (~60 min cook time), and it’s equally wonderful. I just shared my own twist on your recipe on my blog recently actually, where I attempted to make it more summer-y with orange and pineapple. Not surprisingly, it was a huge hit! Thanks for an awesome recipe. These sound amazing, but 15tsp of baking soda? Seems like quite a bit! FYI, the link to the quinoa buckwheat pancakes is broken–perhaps because you “fixed” the recipe and reposted? I could not resist clicking because the name alone sounds so delicious–luckily I found the reposted recipe using the search box! Just made these. It is my first time doing Vegan baking at the first time I am venturing away from the foods that I feel “safe” with. They came out perfect, look and smell incredible, and I cannot wait to enjoy these for breakfast tomorrow. Thanks Gena for the awesome recipe! I just made these, yum yum, delicious and so healthy! I added 4 Tbsp of raisans, a sprinkle or two of nutmeg and 2 Tbsp of milk, because I found the bather to be to thick. I didn’t have dry ginger, so I subbed it for 1 full tpn of fresh ginger and I used coconut oil. They were glorious. My family loved them. Thankyou! These muffins are AMAZING! I have made these a few times now and they are wonderfully adaptable. I’ve added a hand full of craisens, black berries and doubled the recipe with no problems. These always turn out great! All of these modifications sound great! I’m so glad you like the recipe. These are great! I make a lot of banana bread & muffins and like to try new recipes every once in awhile. I did a combo of ww pastry/spelt/oats plus extra flax meal and some protein powder (sun warrior) because muffins aren’t just for breakfast:-) I didn’t fill my cups all the way and got 10 regular muffins plus a bunch of mini muffins for my mini guy. I Have a ?. It says 2 teaspoons AC vinegar to 2/3 cup Soy or almond milk? I’m assuming this is for a buttermilk sub.? THe usual sub. Is 2 Tablespoonfuls- 1 cup …. The 2 teaspoons would be less than called for.. Is there a reason? Thank you.. I’m definitely trying this!! Looks yummy good.. I like that it has a flax egg sub too…. I usually find 2 whole tablespoons to be too much, so this is my preference. You can definitely try more! Made these last night. I used all purpose flour (it’s what I had on hand), cut back on the sugar a bit (used 1/2C as my banana were really ripe) and sprinkled the tops with hemp hearts. What a hit these were this morning at breakfast time! The whole family loved them. I’m so glad to have stumbled upon your recipe and more excitedly your blog…I can’t wait to explore it and try more recipes! Oh and the batter made 12 muffins + 12 mini muffins! Super tasty ! I put way less sugar though 😛 Excellent ! These were great!! Usually I end up disappointed with healthy muffins but these lived up to my dreams. I used regular whole wheat flour and they were fine, but I’m sure they would’ve risen a little more nicely with the pastry flour as written. Can’t wait to experiment with different add-ins! Looks yum! Instead of brown sugar, can you substitute with honey?